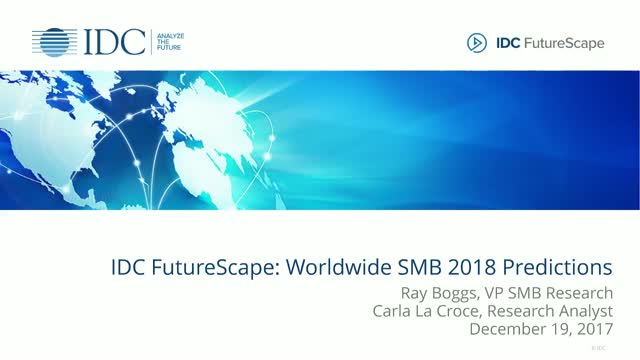 In this IDC FutureScape presentation, the IDC Worldwide SMB team discusses the key predictions that will impact CIOs and IT professionals in the worldwide industry over the next one to three years. Senior IT leaders and line-of-business executives will come away with guidance for managing the implications these predictions harbor for their IT investment priorities and implementation strategies. IDC FutureScape reports are used to shape enterprise IT strategy and planning by providing a basic framework for evaluating IT initiatives in terms of their value to business strategy now and in the foreseeable future. IDC's FutureScapes are comprised of a set of predictions designed to identify a range of pending issues that CIOs and senior technology professionals will confront within the typical three year business planning cycle. Each prediction is assessed on the basis of its complexity, organizational impact, and time frame to expected mainstream adoption. IDC’s 3D printer analysts will discuss the latest research that examines the companies, applications, and market developments that are the most interesting “ones to watch” in the 3D printing industry. This Web conference will offer a comprehensive analysis across the industry, including the impact on printer hardware, materials, service providers, and much more. The insights provided are expected to have significant ramifications for today’s 3D printer market as well as for future market opportunities. Carla la Croce and Alex Stratis investigate diversity and inclusion is skills sourcing. The European vertical market digital scenario is more vibrant than ever, – with some industries that are on the edge of technological change, and others that are rapidly catching-up and showing interesting pockets of growth. •What are the key vertical trends that are driving IT spending in Europe? •How to spot technology hypergrowth pockets? •What is the digital disruption ‘butterfly effect’, and how will it affect European industries? Our webinar will help you improve your vertical go-to-market strategy and tactical planning, – highlighting what is under the spotlight for European industries, learning about real-life examples, and charting out a successful vertical digital roadmap for 2019. Solving the Tech Skills Gap – This Means Business! IDC sees advancement in terms of digital transformation maturity for European retailers. Customer experience personalization is the trigger, and the commerce platform is an essential enabler, of retail innovation. In order to explore this broad and complex reality of European retail, in this IDC FutureScape presentation, the IDC European Retail team discusses the key predictions that will impact line-of-business executives and IT professionals in the European region over the next one to five years. •What will be the main differences, across European countries and retail segments, in terms of business priorities and investment plans? •What drives innovation and digital transformation in the European retail industry? •What will happen in the adoption of the retail commerce platform in Europe, compared to the global peers? •How do retailers plan to differentiate customer experience personalization? •How are retailer organizations using innovation accelerators i.e. IoT, Artificial Intelligence, 3D, Robotics, VR/AR, and Blockchain? After years of customers evaluating the case for IoT, the market is now entering a critical phase with European IoT spending expected to reach $159 billion in 2019. We are experiencing a dichotomy scenario across European IoT adopters: while we are starting to see a few advanced IoT users leveraging IoT technologies in full swing, there are still a large portion of users struggling to prove and replicate initial pilots and proof of concepts. Join us for this complimentary webcast to better understand the pulse of the European IoT community, hear about interesting European successful case stories and discover those trends and topics, such as Edge Computing and Artificial Intelligence, that will characterize the IoT landscape evolution in 2019. The pace of change in the telecoms industry continues to accelerate. Telcos find themselves up against new forms of competition as the underlying infrastructure is virtualised and cloudified. They have to address successive waves of new technologies such as 5G, SDN, IoT, AI and edge. And they need to transform their operations and processes to adapt to the digital environment. Join us for this complimentary webcast to understand what telcos in Europe will face in 2019 and how they should respond. CIOs and IT organizations across Europe are challenged to support business units with modernization initiatives as they respond to persistent challenges and opportunities in the digital era. The ability to accelerate transformation of application estates will be one of the most critical business objectives for organizations in the next half decade. Enterprises failing to transform digital/application creation ability in that timeframe risk closure. While change is hard, enterprises in Europe realize that futureproofing application development and deployment capabilities demands willpower, strategic investment and cultural adjustments. The next phase of enterprise transformation requires organizations to modernize existing applications without undermining current functionality while building new applications that are cloud native. As part of this process, companies must adopt modern development and deployment practices that accelerate application delivery, address the challenges of talent shortage and developer re-skilling, and understand the rising role and options for AI. •IDC’s predictions for the DevOps, Developer and the Cloud Platform market in Europe and detail about how quickly critical industry changes will take root. Digital transformation is a key strategy for every company of size across Europe, as organizations look to remain relevant and competitive in the age of digital business. IDC finds that AI is a key enabler of that transformation, allowing businesses to reimagine processes, services and value propositions to customers. Yet while the focus on customers is as strong as ever but as experience matures, European companies are increasingly looking to AI to drive internal process improvement as well as improve customer experience. In this IDC Web Conference, Neil Ward-Dutton, VP of AI and DX European Research Practices, and Andrea Minonne, Research Analyst for IDC's Customer Insight & Analysis team, will discuss the transformative power of AI for European companies, drawing on IDC's qualitative and quantitative research and examples to discuss what are the top drivers and barriers, which are the key use cases, technology and industry adoptions trends across Europe. IDC Canada's Lars Goransson and Tony Olvet present our key technology predictions for Canada that will impact every enterprise's ability to grow and compete over the next 18-36 months. This 45-minute webcast will unveil 10 key predictions across three main themes: business innovation, accelerated infrastructure, and the future of work. From artificial intelligence (AI) and the Internet of Things (IoT), to cybersecurity and digital identities, technology continues to shape business in every sector of the economy. How will these IT trends impact your organization and your customers? IDC’s predictions web conferences provide the vision and insight needed to navigate the rapidly changing landscape. We will draw on IDC’s industry-defining research as a foundation of our outlook and guidance to business and technology leaders in Canada. 90% of retailers worldwide don't have a defined innovation strategy and are executing an opportunistic innovation approach. The opportunity for retailers is embracing business model innovation at scale, while delivering profitable growth for commerce everywhere operating models. Listen to this IDC webinar, where our analysts share how retailers can advance in their journeys towards innovation excellence. The webinar focuses on the essentiality of developing a retail innovation culture that leads business model innovation strategies, is enabled by organizational and process transformation, and is fundamentally delivered at speed through retail commerce platforms. The rapidly approaching deadline in the European Union's Falsified Medicines Directive (FMD) for drug serialization and traceability is currently the top concern of life science companies supplying pharmaceutical products to European markets. European life sciences companies need to act immediately, and invest in serialization and information management solutions to avoid delays in compliance and the related penalties. However, they can (and should) take a more proactive approach to compliance-triggered digital investments, and capitalize on this opportunity to upgrade their digital systems and operations and derive longer-term business value for their supply chains. In this webinar, an IDC Health Insights analyst will discuss the imperatives for digital transformation in European supply chains and the broader potential of the 3rd platform and innovation accelerator technologies to help life science companies achieve "smart compliance," and turn their supply chains into a source of competitive advantage through the adoption of IDC's STAR(S)2 approach. Nino Giguashvili is Senior Research Analyst for IDC Health Insights Europe. Her core research covers ICT developments in the healthcare and life science industries of the region, analyzing key technology and business issues facing healthcare and public health organizations, pharmaceutical companies, and their ICT vendors, and offering in-depth insights into the primary factors shaping the industry in the region. She advises industry organizations and ICT vendors on planning and implementing effective digital health transformation initiatives to drive business innovation. Content delivery networks (CDNs) carry a substantial portion of the world's internet traffic and are an essential component in handling the demands created by the massive amount of Web content, live high-definition (HD) video, flash sales, and large downloads on the Internet today. CDN technology also provides significant commercial benefits to enterprises that increasingly rely on cloud performance, availability, security, and analytics to create value with their end users. In this IDC Web conference, Ghassan Abdo and Melissa Fremeijer will provide an overview of the current CDN market and discuss several trends that will impact the CDN services market for the foreseeable future. IDC's Carrie MacGillivray and Stacy Crook offer the first glimpse at the rich data gathered from IDC's Global Internet of Things (IoT) Decision Maker Survey, 2018/19. This is IDC's largest IoT survey to date with almost 5,000 respondents from 25 countries. It takes a deep dive into the issues facing organizations as they look to deploy IoT with regards to choosing the right vendor, how they are making sure their deployment is secure, and how they are using analytics. The survey also provides insight into how organizations are actually monetizing their IoT investments. This year's survey is guaranteed to highlight new trends and strategies that are emerging in IoT as we enter 2019. Join us for an exclusive webinar as we walk you through IDC’s latest research into the Egyptian ICT market. The session will provide an overview of the recently released IDC Egypt ICT Report 2018, which provides in-depth market sizing data for 2017 and 2018, as well as insights into the market’s primary drivers and challenges, most influential technology trends, and key growth opportunities for the year ahead. Did you know 85% of Marketers now rate customer loyalty and customer advocacy as one of their most important Key Performance Indicators (KPIs)? The era of customer experience is upon us. With ever rising customer expectations, and increasing compliance regulations around the world, IDC believes that winning in this new environment requires content marketers to think differently about their role in the customer relationship. Consent is one of the first steps in customer experience. Learn how to create various value exchanges through content marketing that will keep readers engaged and move them from prospect to loyal customer. Join IDC Custom Solutions and Gerry Murray for a 45-minute webcast outlining how customer expectations are changing, and how marketers can successfully adapt. Gerry will review the Hierarchy of Customer Expectations and mentor marketing, and offer best practices on how marketers and organizations can move beyond standard messaging, to add personalized value at every touchpoint in this new era of consent. He will focus on best practices for creating, distributing and measuring engaging marketing content. Included in the presentation will be tactical advice on how to optimize your marketing content by focusing on design, delivery and promotion, and subsequent awareness, effectiveness and usage measurement. A Q&A session with the audience will follow the presentation. • What is the customer hierarchy and why does it matter? • What do I need to do with my marketing content? Where should I focus? • How can I improve experience for customers and leads in my role? • What are the best practices for leveraging marketing content to increase consent and customer experience? • What are the best practices for developing and measuring content?